One of the special privleges of being a wedding photographer is documenting the special moments between people. The relationship between a bride and her father is so full of emotion. As this bride said "It is a special moment when.the first man you ever loved walks you to the one man you will love forever." 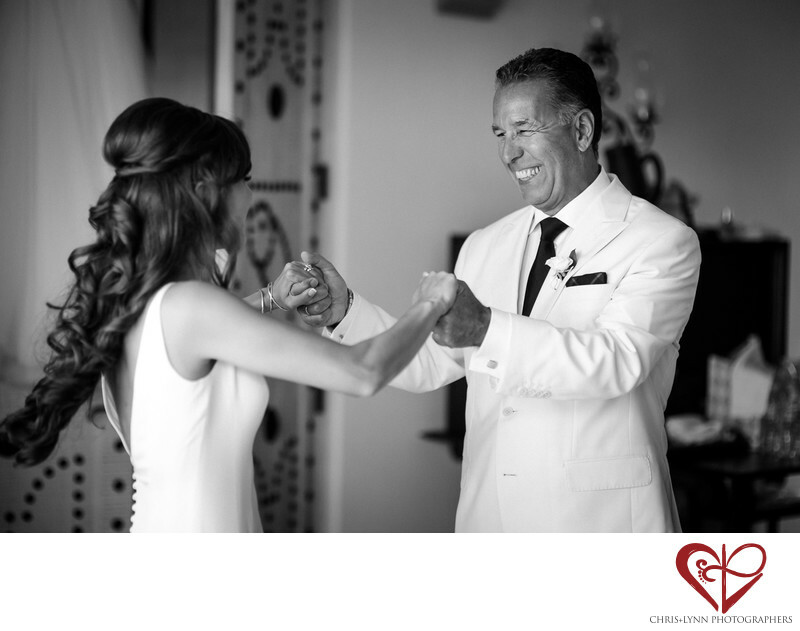 This bride got ready in a large suite at the One and Only Palmilla and midway through her bridal preparations, her father came in to see her, beaming with love and pride. As we are photographing all the individual details of the day - special objects like the dress, wedding rings, invitations, shoes and bouquets, - we are always aware that photos of moments are what couples often end up cherishing the most. Anticipating & capturing these unscripted, real, and impossible to recreate moments is our most important job. We feel privileged to regularly photograph weddings at the One & Only Palmilla, a resort Forbes magazine recently called "the best resort in Mexico and one of the most exclusive escapes on Earth". This beautiful One & Only Palmilla Wedding was featured in Destination I Do Magazine.